Properties in Wharewaka average 4.4 out of 5 stars. Great location in Wharewaka, short walk to the Lake. 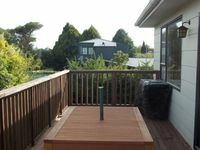 Property 7: Great location in Wharewaka, short walk to the Lake. Property 11: Wharewaka Winner - Swim, bike, run, relax! Two Attached Homes - Holiday Close Together with Your Own Space! Property 18: Two Attached Homes - Holiday Close Together with Your Own Space! Classic kiwi experience in Five Mile Bay. Free WiFi. Property 49: Classic kiwi experience in Five Mile Bay. Free WiFi. A lovely clean modern home with everything you need. We have had a fantastic stay. Great home, clean and warm, and an awesome location.